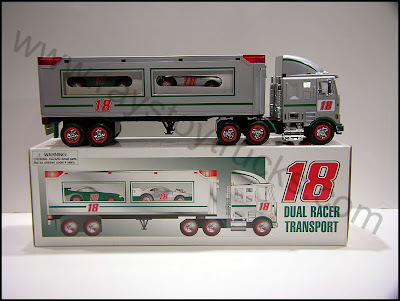 Some of you may have heard about or seen this very rare and low production of the elusive #18 Toy Truck. 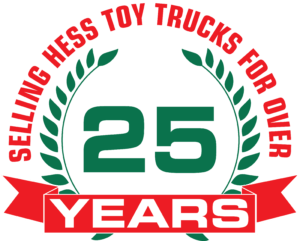 This truck is a re-issue of the popular 1997 Hess Truck & Racers featuring a big 18-wheeler with not one, but two race cars inside. The cars were powered by friction motors and had working headlights and taillights. Of course, the truck had working headlights, taillights, and running lights, too. This is the largest truck that Hess had released in its collection. 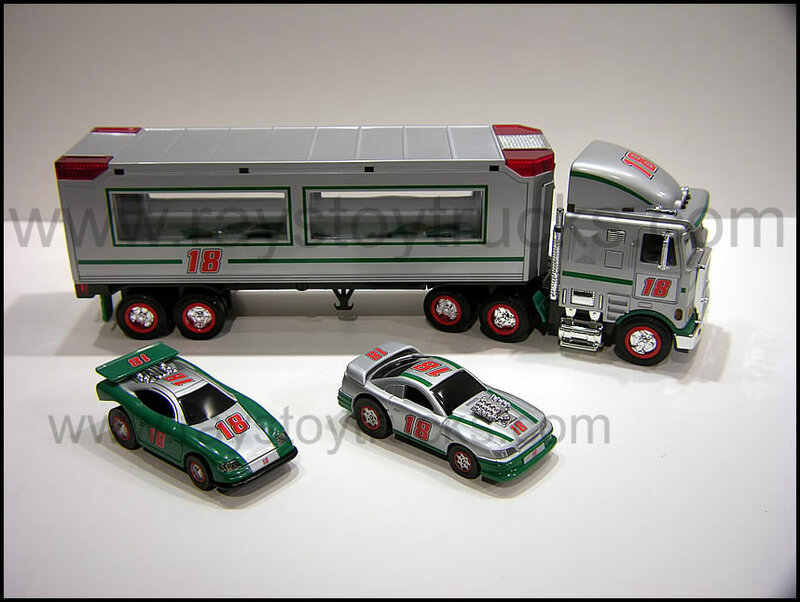 Now the difference between the original 1997 Hess truck and this special edition is the color and side markings. This truck is molded in a silver plastic with a single green stripe and the number 18 on the doors, sides of the truck, rear panel, front grille and top air dam. The race cars are also different as one is done in silver and the other in green and silver. Both have the #18 adorned on them. 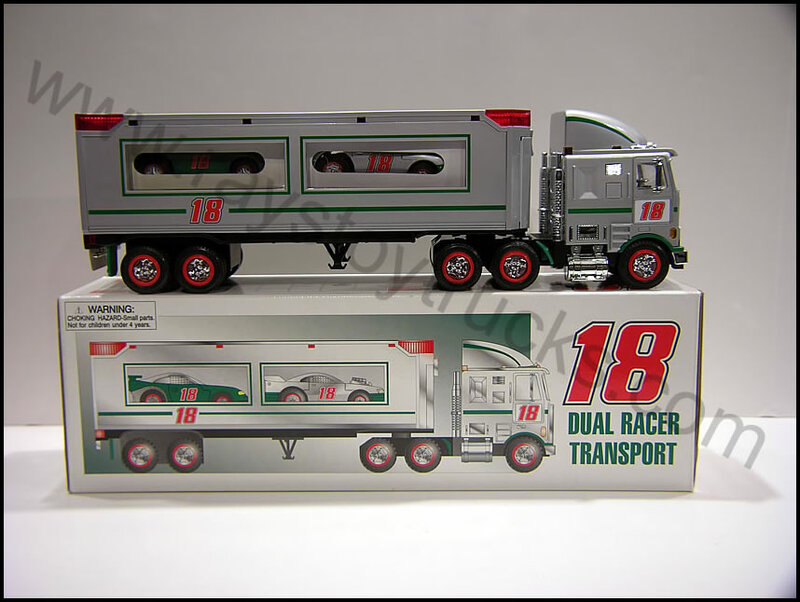 The box is also unique showing a picture of the truck displaying the race cars inside and reads “18 Dual Racer Transport” one the front portion of the box. Ok, so you are all wondering why this was produced and what’s the story is behind the truck being made. Well here is the exclusive scoop on it. John Hess and Joe Gibbs of Joe Gibbs Racing and better known as the coach of the football Washington Redskins were and still are very good friends. John Hess had these trucks made up for his friend Joe to go along with his NASCAR race team . 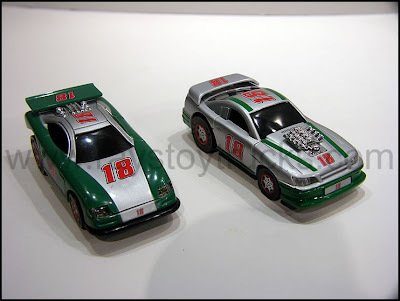 It was designed with his race car #18 adorning all sides of the truck and racers. There were less than 100 made and were packed in 6 and 12 pack cases, none of which were sold to the public. They were given to Gibbs to do whatever he wanted with them. Although not a true Hess edition this is still a very rare and unique collectible. Joe Gibbs Racing (JGR) is a group of NASCAR racing teams owned and operated by former Washington Redskins coach Joe Gibbs, who first started racing on the NASCAR circuit in 1991, and J. D. Gibbs, his son. Headquartered in Huntersville, North Carolina, near Charlotte, the team has amassed three Sprint Cup championships since the year 2000 and participated in other lower-tier NASCAR series for driver development, winning one championship in the East Division of the NASCAR Camping World. For the team’s first sixteen seasons, JGR ran cars from General Motors. During that period the team won their three championships, two in Pontiac Grand Prixes and one in a Chevrolet Monte Carlo. Despite this, JGR felt as if they weren’t as important as some of the other GM teams such as Hendricks Motorsports and Richard Childress Racing. Therefore, during the 2007 season Joe Gibbs Racing announced that they would be ending their arrangement with GM at the end of the year and begin running Toyotas the following season. Since then, JGR has become the strongest and has won the most out of any Toyota team.